eQSL recebido: DD1UN, Höpfingen, Germany, 3.5 MHz, QSO w/ RJ55YG. We are glad to verify your reception report on CRI Spanish program transmitted on 7335 kHz at 21:05 hours – 21:46 hours UTC dated March 30th, 2016. 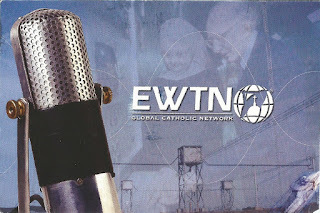 We are glad to verify your reception report on our program transmitted on 11690 kHz at 12:00 hours- 12:18 hours UTC dated March 13th, 2016. China Radio International – 7.335 kHz – Jinhua/CHN. 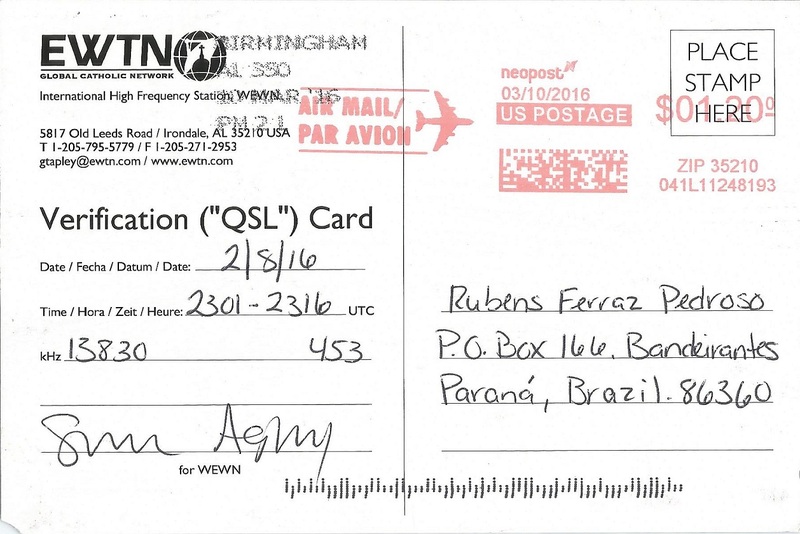 eQSL recebido: DO8CW/P, Kamen, Germany, 1,75 MHz (WPX SSB Contest 2.016). Obs: Estação ouvida fazendo chamadas para contest: CQ CQ Contest. 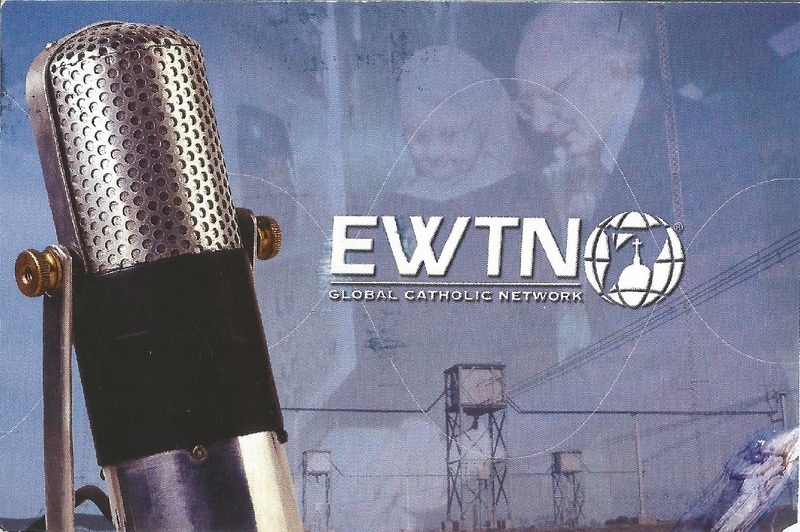 EWTN – 13.830 kHz – Vandiver/AL/USA. eQSL recebido: IR4M, Montecodruzzo (FC), Italy, 7 MHz, QSO w/ S50D (WPX SSB Contest 2.016). eQSL recebido: OK4GP, Pelhrimov, Czech Republic, 7 MHz, QSO w/ IR2R (WPX SSB Contest 2.016). eQSL recebido: MM8T, Outer Hebrides, Scotland, 7 MHz, QSO w/ S50D (WPX SSB Contest 2.016). We are glad to verify your reception report on PBS Sichuan program transmitted on 7225 kHz at 23:06 hours- 23:24 hours UTC dated March 11th, 2016. 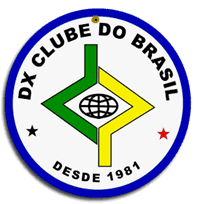 Escuta de transmissão em Yi. eQSL recebido: YO9XC, Buzau, Romania, 3.5 MHz, QSO w/ DP6A (WPX SSB Contest 2.016). eQSL recebido: HA6PJ, Salgótarján, Hungary, 7 MHz, QSO w/ 9A705Y (WPX SSB Contest 2.016). eQSL recebido: EI7JZ, Cork, Ireland, 3.5 MHz, QSO w/ RC9O (WPX SSB Contest 2.016). eQSL recebido: SO1TH, Choszczno, Poland, 7 MHz, QSO w/ M0WUT (WPX SSB Contest 2.016). eQSL recebido: R2GB, Lipetsk, Russia, 3.5 MHz, QSO w/ YU5A (WPX SSB Contest 2.016). eQSL recebido: YB6HAI, Medan Marelan, Indonesia, 7 MHz, QSO w/ S570ZRS (WPX SSB Contest 2.016). 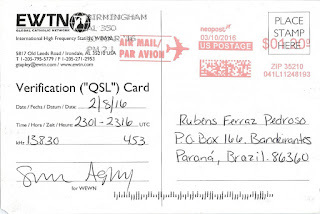 eQSL recebido: HB9MOZ, Dotzigen, Switzerland, 3.5 MHz, QSO w/ YU5A (WPX SSB Contest 2.016). Distância entre Bandeirantes e Toledo: 387,63 Km. eQSL recebido: DB8AH, Alpen, Germany, 7 MHz, QSO w/ 9A705Y (WPX SSB Contest 2.016). eQSL recebido: 4S7VG, Wattala, Sri Lanka, 21 MHz, QSO w/ PA0LUX.